I came across an interesting Labour Front government White Paper dated 1956 on the issue of the Singapore Chinese Middle Schools Students’ Union (SCMSSU). In brief, the SCMSSU (October 1955 – September 1956) was a mass student organisation for Chinese Middle School Students that participated in leftist and anti-colonial struggle against the unfair treatment of Chinese education. It was banned by the Labour Front government on 24 September 1956 over charges that it was a communist front organisation. Leftists and revisionist historians have challenged the government’s accusations of CPM subversion and claimed that the SCMSSU did not engage in political struggle. However, such revisionist accounts do not square entirely with documentary evidence. The following is a commentary about the SCMSSU based on the White Paper and other sources. The original White Paper can be accessed here. In 1954, a delegation of over-aged Chinese Middle School students stood up to oppose the colonial government’s attempt to enforce conscription in Singapore. 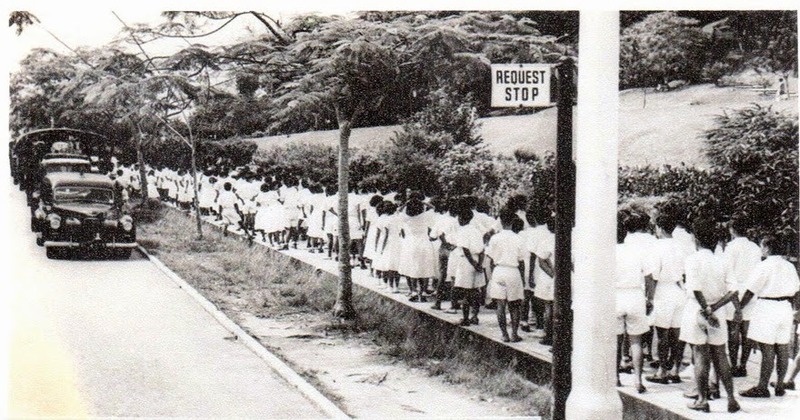 The students’ opposition to National Service culminated in riots when student demonstrators clashed with police on 13 May 1954 resulting in many injuries. This clash was followed by two years of student-led political action against the government. This same delegation of students eventually formed the SCMSSU with fiery student leader Soon Loh Boon as its president. Even at this early stage, some of the leaders of this delegation may have been CPM members or subsequently became targets of cultivation for the CPM. 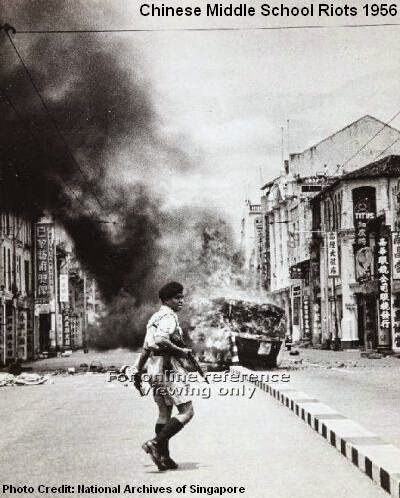 For more Chiam Chong Chian, read the earlier posts talking about his early life and how he organised the Anti-National Service Riots. After its formal registration on 6 October 1955, the SCMSSU became involved in more anti-colonial activities with leftist organisations such as the Singapore Factory and Shop Workers’ Union led by pro-communist Lim Chin Siong, and the Singapore Women’s Federation led by CPM member Chen Mong Hock. Their struggles prompted the government to ban the SCMSSU on 24 September 1956, causing even more anger among the Chinese Middle School students. In this context, the government issued the 1956 White Paper to justify the dissolution of the SCMSSU for being a “Communist Front Organisation”. In his recent book “My Youth in Black and White” published in 2014, pro-communist leader and former ISA-detainee Lim Chin Joo (brother of Lim Chin Siong) dismisses communist involvement in the SCMSSU and argued that the CPM was not the leader or instigator of leftist student movements. He further claimed there was no conclusive proof that the SCMSSU was engaged in any leftist political activity. Although the White Paper suffers from anti-communist bias, the facts of the White Paper clearly demonstrate that the SCMSSU was a prominent pro-CPM participant in the leftist and anti-colonial politics of that time. According to the White Paper, although the government had registered the SCMSSU on condition that the students abstain from politics, the SCMSSU still managed to involve itself in leftist rallies, labour disputes and propaganda work to defend against any perceived threats to Chinese education, Chinese students and workers rights. The White Paper also singled out the SCMSSU’s “Hsueh-Hsih” (Study) campaign as evidence of CPM influence. According to the White Paper, the term “Hsueh-Hsih” is derived from the Chinese Communist Party (CCP) slogan, which approximately means “Study for Action”. However, it is not clear whether the SCMSSU’s definition of “Hsueh-Hsih” was truly communist in nature. At the time, there were conflicting interpretations of the term even within the SCMSSU itself. Regardless, the methods of the Hsueh-Hsih campaign as stated in the White Paper did offer the CPM an avenue to discreetly influence the students. By organising picnics, meetings and study groups outside of their parents’ and teachers’ supervision, the CPM could isolate the students’ from sources of reactionary influence. Interestingly, the White Paper stated that the SCMSSU had even adopted “Criticism and Self-Criticism” exercises to foster solidarity amongst the students. In these exercises, students would undergo a round of public criticism in front of their peers for errors in their ideology and personality. The White Paper claimed that such “criticism” exercises can trace their origins to the CCP’s indoctrination tactics and was allegedly used by the SCMSSU to pressure political opponents. In its closing paragraphs, the White Paper also declared that the government had detained “several student members who have had Communist connections, one of them a Union official who produced copies of M.C.P. [Malayan Communist Party] secret and illegal publications on subversion”. One of the arrested SCMSSU officials handed over documents explaining the CPM view that Hsueh Hsih “helps comrades to gather sufficient strength to meet the high tide of revolution” and defined Criticism and Self-Criticism as “the propelling power of the revolution”. There were also instructions to apply the lessons of the CCP’s victory in China to the “National Liberation movement in colonies and semi-colonies” (including Malaya). One of the arrested students was eventually convicted and sentenced to 5 years imprisonment for possessing these CPM materials (See White Paper, p.18). All this lends credence to academics who have long acknowledged that the CPM had established an extensive network of communist and leftist sympathisers among the Chinese Middle School students. Nevertheless, not all leftist student leaders were acting for the CPM. Indeed, CPM operations were aided by the growing anti-colonial sentiments of many Chinese school students. Had the communists been more patient and harvested the enthusiastic student and labour movement for a showdown at the ballot box, the history of Singapore would have been different. But what happened between the years 1954 and 1956 was that societal unrest, in part instigated by communists, gave the colonial authorities reasons to target what they saw as CPM front organisations and detain any CPM leaders involved. Such was the fate of the SCMSSU.